Plymouth is about 800 people who have covenanted to walk together as a Christian community. We are an Open and Affirming congregation and while we don’t all look or think alike, we all worship together. We worship as a family of faith, gathered in the name of Jesus Christ. It is the experience of worship that shapes us, defines us and propels us into our lives and missions and ministries, seeking to serve the world around us. Plymouth is a member of the United Church of Christ (UCC). Just as various churches within the UCC may hold differing positions, so too do individual members within Plymouth. We see this as one the greatest blessings and strengths of our beloved church. See> Our Beliefs. 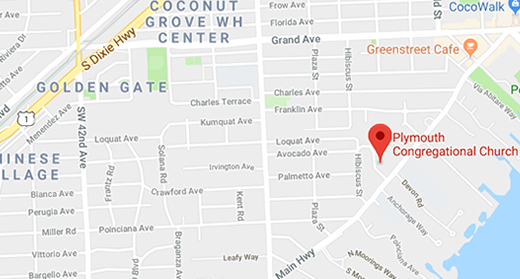 For well over a hundred years Plymouth has lived in the Coconut Grove neighborhood of Miami. In 2017, as one of the most historical churches in Miami, we will celebrate the 100th anniversary of our sanctuary. Come walk around our 12-acre campus and enjoy our oasis in the middle of the city. Then, join us for worship at 10 am on Sunday morning. In music and scripture and work and prayer we become the church of Jesus Christ. Together we are Plymouth Church. Join us.